LUKLA, June 22: During his decades-long career as a hotel entrepreneur in the Everest region, former judo champion of Nepal Kazi Sherpa has seen many Olympic medalists visit the rugged mountain trails of Nepal for high-altitude training with a belief that such training would improve the prospect of winning medals during international games. However, the government of Nepal is least concerned about the potential the region holds in the sporting sector. 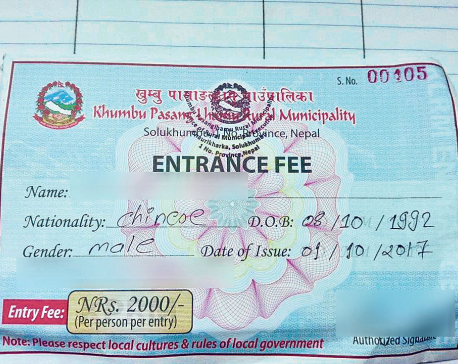 The locals say that the government has shown very little interest in developing sports in the remote areas of Khumbu, which is accessible only by foot or air. “Olympic champions come here for preparation because the high-altitude training boosts their chances of winning medals. I have met many of them and they have eventually succeeded in their mission,” says Sherpa, a silver medalist himself during the South Asian Judo Championships held in New Delhi, India in 1992. At a time when the government is unwilling to invest in sports in this remote mountainous place, Sherpa says that a Japanese judo player proposed opening a judo club in the region during one of his visits upon seeing bright prospect here. “The people here are naturally strong due to the geography. So they have good potential of winning medals for the country,” says another medalist of Nepal, Ramesh Magar, who was in the Khumbu region in the last week of May for the inauguration of the first-ever judo training center in the highest place in Nepal. Magar, who had secured one gold and a silver medal during the South Asian Judo Championships held in Pakistan in 2011, further says that it is very difficult to train in high altitude but that would eventually pay off when they get back to the lower altitudes. Besides the newly-opened Everest Judo Club in Monjo at an altitude of 2850 meters above the sea level, there isn't any professional sporting club in the entire region, claimed Sherpa. Chairman of the District Sports Development Committee, Solukhumbu D B Nepali said that they only organize seasonal games in the region. “Except ice-climbing, we don't have any other professional sporting events here,” said Sherpa, who runs a hotel at Jorsalle, which lies within the perimeter of the Sagarmatha National Park. Dayangi Sherpa, a teacher at Shree Yuba Barsha Basic School in Monjo, says that sport is taken only as recreational activity and the region is far from developing professional attitude toward sports. According to her, students play football and other sports but they don't know proper rules since there is no one to teach them professional sports. 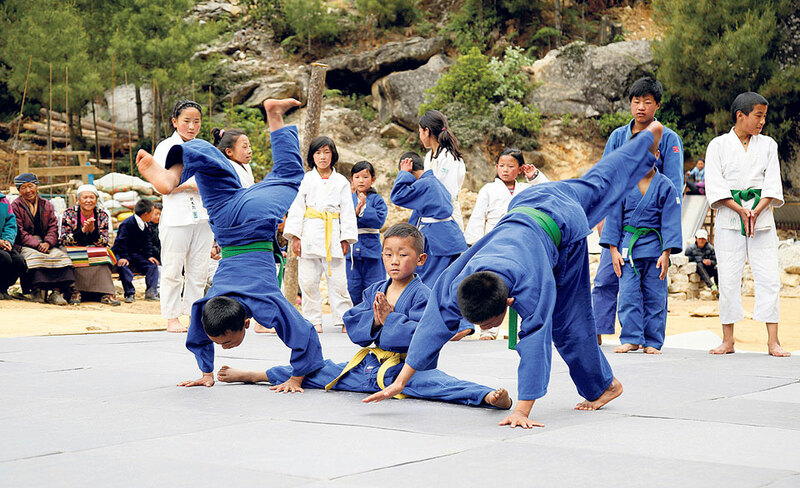 “We teachers ourselves teach them sports after reading the rules in books and internet,” said Sherpa, adding that she was seeing professional sports for the first time in the region after the establishment of the judo club on May 30. Sherpa narrated the story of Sir Edmund Hillary, the first man to conquer the world's highest peak Mt Everest, opening schools in the then impoverished region back in the mid-20th century. Fast forward to the 21st century, the market places in the Everest region resemble Kathmandu's down-town Thamel. The Khumbu region, as it is known in the local language, has all the modern facilities including television, internet, wifi, helicopter service except roads and sports. “Altogether there are seven schools in the Khumbu region,” she said, counting them one by one. “But there isn't any sporting club,” she added. The establishment of Everest Judo Club has excited the entire village, says Gokarna Rai, principal of Shree Barsha Basic School. Rai said that the students have become disciplined after learning judo, which was in practice since last year although it was officially opened just recently. “It is a dream come true for us,” says Takashi Yamaguchi, a Japanese judo player who contributed a lot in setting up the club in one of the most remote places of the world. The judo club was established on the initiative of Nepal Judo Association's General Secretary Dharma Kumar Shrestha with support from well-wishers in Japan including Yamaguchi, Tomoki Khazami, Yokota Yoshifumi and Shyam Maharjan. Kazi Sherpa is currently the in-charge of the one and only judo club in the entire Himalayan range of Nepal. Forty-four-year old Sherpa, who in his heydays was selected to play in Germany's top-tier Bundesliga from Aunsberg Judo Club, says he still cannot still believe that a judo club has been established in a remote place, which is inaccessible to roads. “Now, the children here don't have to go all the way to Kathmandu to learn judo like I did,” said Sherpa. Meanwhile, NJA General Secretary Shrestha said that the opening of the judo club in the Everest region was the first step in their search for talents in every corner of the country. International Judo Federation on its website wrote that European Champion and Olympic bronze medalist Sabrina Filzmoser has been supporting the development of judo in the region for many years. “It is the perfect place, on the way up to Everest base camp just before Namche Bazar. Where all the Everest-tourists go,” IJF Media Director Nicolas Messner quoted Filzmoser as saying.